Oral health: Cumin possesses antimicrobial properties able to fight dental plaque. It is used in some countries to prevent tooth decay and gingivitis. In some Arab countries, the seeds are chewed after meals to maintain oral hygiene. Appetizer: Aromatic oils of these grains, stimulate gastric secretions and appetite. Specifically, the cuminal is a substance of cumin acting as a stomachic tonic with origenic virtues (it increases appetite). An infusion or powder of this plant is indicated in cases of loss of appetite in people with poor appetite, listless, for those who want to gain weight or for people with anorexia. Digestive: The fragrance of cumin exerts a tonic effect of the digestive system. It stimulates stomach secretions and fights bacteria H. pylori, which is responsible for stomach ulcers and gastritis. We recommend taking cumin especially for people with hyposecretive dyspepsia, stomach ache (cumin also has analgesic properties) and as general digestive plant. Flatulence or farting: Cumin is a carminative remedy par excellence, and shares these properties with other plants of the same family as anise, dill or fennel (Umbelliferae family). Indeed, cumin favors expelling digestive gas and reduces bloating, these being their main applications in many countries. This medicinal use was already employed by the Greeks and Romans by means of taking a few seeds after a meal. The infusion or cumin powder is used to treat aerophagia, for flatulence and bloating and cramping caused by gases. It is also soothing and antispasmodic, so it helps relieve cramps. In India, the cumin seeds are smoked in a pipe with ghee (clarified butter) to relieve hiccups. Plants of the Umbelliferae family are the main carminative plants (plants that help remove gases from the digestive tract). Among them, the most popular are fennel, cumin, caraway, coriander and anise. Prepare an infusion with the fruits of these four herbs in equal parts to increase its medicinal properties. Colon cancer: Cumin supplementation is also effective in preventing colon cancer, as recent studies show. 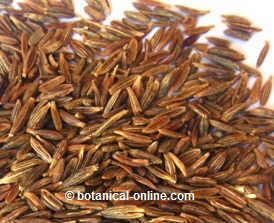 Intestinal parasites: The fragrance given off by cumin indicates its rich aromatic oils. These oils have antibacterial and vermifuge properties. Scientific studies have shown that cumin is also effective against the parasite that causes intestinal hookworm. Cumin has hypoglycemic properties and it is a very interesting herb for treating diabetes. Scientific studies indicate that supplementation of cumin (taken for at least 6 weeks) has antidiabetic properties and improves the analytical values ​​(glycosylated hemoglobin, reducing blood glucose and triglycerides). Studies even suggest that supplementation of cumin is more effective than some oral antidiabetics (glibenclamide) to combat Type II Diabetes Mellitus. Cumin is a seed rich in iron that can be used as a supplement for people with anemia and also by their content of aromatics aperient properties, to treat loss of appetite that accompanies the symptoms of anemia. It is essential to accompany these supplements for anemia with a diet for anemia, to assimilate the nutrients we eat. The amount of iron a day recommended for women is 15mg., and 10mg for men. One teaspoon of cumin (5g.) contribute with 3.31 mg. of Iron: 20% of daily iron requirements! Nervous system: Cumin essential oil has a sedative, analgesic effect and slightly soporific effects. This fruit contains at least 7 demonstrated analgesic components, among which many of their flavors are included. For example, cumin plant is richer in pcymene, an analgesic, aromatic and antimicrobial substance. It also contains other flavors for pain as eugenol, myrcene and caryophyllene. For these properties, cumin is recommended in cases of nervous dyspepsia (” nervous stomach”), anxiety, diarrhea and flatulence. Ayurvedic medicine uses cumin in the treatment of insomnia. Aromatherapy: Essential oil, obtained by steam distillation of cumin mature seeds, is used in aromatherapy. This oil is suitable to treat nervous disorders (migraine, stress,…), gastrointestinal disorders (flatulence, colic or indigestion) and circulation problems. This oil can be combined with rosemary oil, lavender oil, galbanum or cardamom. Cumin increases breast size: Scientific studies have shown that supplementation with cumin increases the number of mammary cells, resulting in a greater volume of the busts. Spice in food: You can use it as a spice in food (see more information in the listing above). Infusion: 2 grams of cumin seeds (half teaspoon) whole or crushed, per cup of water. 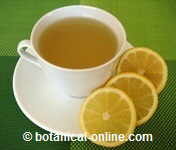 Take a cup before a meal as an aperitif, or after meals for its digestive properties. You can also take as a carminative. In case of infants, 3 teaspoons of this infusion after meals. 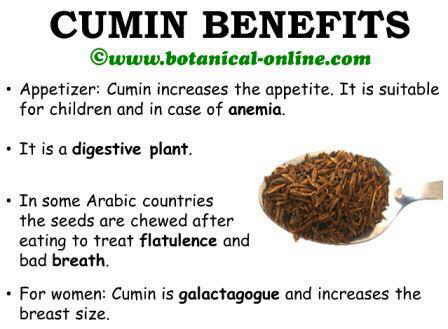 Cumin powder: 300600 mg. (10 fruits) per day with a glass of water or milk. Do not exceed 6 grams daily. Mother tincture: 50 drops three times a day. Essential oil: 0.06 0.2 ml per dose. ATTENTION!! : Essential oil is not recommended for internal use without professional supervision, as, used in this way, it is highly concentrated and it is difficult to regulate its medicinal doses. Children under 6, pregnant or lactating women should NOT take it.